As a kid I remember the elation I felt on Easter morning when I saw the basket of goodies the Bunny had left me. My basket often had a small stuffed animal or trinket, but the bulk of the haul was candy: jellybeans, chocolate rabbits, Peeps and more. These days it seems the Easter Bunny has gotten more health conscious because my kids' baskets are always lighter on the candy and include things like toothbrushes and socks nestled next to the standard stuffed animal. 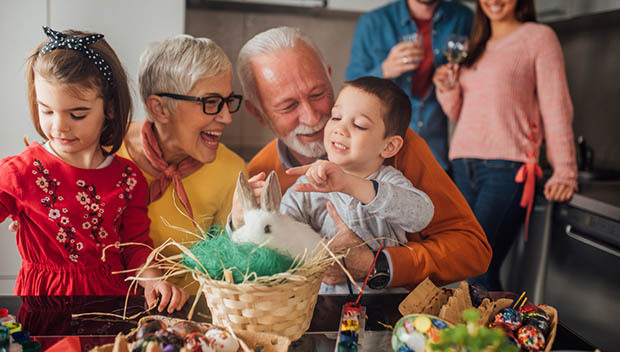 If your family gets treats from the Easter Bunny, here are some of the things you may find in your baskets this year. Easter is the unofficial kickoff of warmer weather, so it's a great time to update the materials needed for outdoor fun, such as sidewalk chalk, jump ropes, sunglasses and bubbles. Kids are adorable, but they're also kind of gross. Help the lights of your life clean up with these fun personal items: bath toys, toothbrushes and toothpaste, Chapstick, hair ties or fun bows, detangling spray, deodorant, sunscreen and bubble bath. If your kids are in spring sports or if they need replacement items for yearlong activities, let the Easter Bunny help out! Tennis balls, baseballs, softballs, swim caps, goggles, cleats, shin guards and bike helmets are all good options. If you are working on decreasing your family's footprint, reusable straws, reusable zippered bags for lunches, organic snacks and gardening supplies and tools will help your family get going. You can't go wrong with earbuds or headphones, cash (unique coins or $2 bills are always a hit), gift cards and movie tickets. Between broken Crayons, dried out glue sticks and uncapped markers, kids are always in need of new art supplies. This is a great time to replace the basics or round out the supply collection with new and fun times, with items such as construction paper, slime-making materials, scented pens, simple knitting kits, stickers or coloring books. Books make excellent gifts. They are an experience and a thing, and they can be enjoyed over and over again before being passed on for someone else to love. This cute Draw and Write Journal is a fun idea for kids old enough to write. Holiday pajamas, dressy church clothes or a fresh spring outfit are all great Easter basket fillers. Socks and undies are also usually a welcome addition to any kid's tired basics. If you want to be extra, you and the kids can "plant" jellybeans in the yard that will "grow" overnight into lollipops. Or if you plan in advance, plant wheat grass with the kids in a basket that will later be their Easter Basket.